--Forest Blending: Sylvaan elves almost always have an advantage while in the forest. Their nature allows them to hide with very little effort. --Hawkeye: Because they live in the forest, it's to no suprise that they have excellent vision. This allows them to aim better and spot things with greater ease. --Bulky: Sylvaan elves are not as agile as everyone else. Their bulk prevents them from becoming good agility classes. --Out of Habitat: Sylvaan elves do not usually go out of their element, the forest. As such, they seem to stand out. They never tread lightly because they were never taught to do so, etc. Gardrim has lived for hundreds of years in the various Forest acting as both a protector and inhabitant. Little is known about his origins and he seldom speaks to others about his past. He is in fact a friendly person to anyone who doesn’t threaten nature or the forests. He seldom leaves the forest or has much contact with people. When he dose and it is a friendly one, he makes merrymaking and tells tales and sings songs of nature and the glories of Elven past. When it is not so much of a friendly meeting he unleashes the fury of nature upon the poor fools who dare offend the Forest. --Skin: pale Brown if washed, but appears in multi-shades of earthy and dark green colours. He is one with nature almost literally his body is covered in mud and plants and moss and fungi. People have mistaken him for some kind of vial Forest giant due to his massive size and almost unrecognisable looks from a distance. He stands at about six feet six although is usual hunched to reduce his actual visual size. His shoulders are broad and muscles huge, he has a dark brown beard and is defiantly a sight to behold and a very unique character. Gardrim is huge in both height and muscle. Like his brethren he is bulky but more with muscle than fat his movements are nether swift nor quiet but his strength is something to be feared. Over the years he has come to realise that weapon are useless for someone who loses them often, so spends most conflicts when still human using his natural weapons his fists. His punches are strong, he has very little technique and even littler agility than usual in his race but packs a mean punch. In affect he his marginaly stronger than a normal Sylvaan Elf bordering on a strong increase but he's also has far less agility and is a huge target. More for keeping his modesty but somewhat for helping him hide his skin and body is deeply camouflaged in mud and leaves and bits of plants. Although he wears no cloths as to call them clothes his body has become home to several tangle plants and moss and even the odd mushroom. When transforming they disappear with his normal body the things have become part of him. This increases his natural Forest hiding ability. looking at him up close he is clearly still a elf however. Gardrim’s actual age is unclear he spends most of his life in the Forest in solitude other than the animals and plants of the Forest so has had no need for such as number. He has almost become a legend among other elves as to his existence. Due to years of living in the wild and his massive amount of muscles he is quite resilient this added to his body covered in mud and plants with years of enduring scratches and scrapes in the Forest and bushes. because of this he can take punishment better than most giving him some defence against blunt attacks. Due to his bulk though he is not the most agile warrior when in human form. 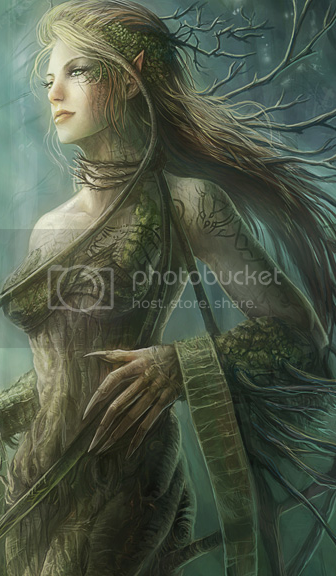 Appearance: 5’4, pale slightly green tinted skin with a light bark like texture, leaf green eyes. Blond long flowing hair, flows to twigs in places. Dress: Naked, exempt for the leaves and vines that cover her. Last edited by fish-orb on Sat Jun 13, 2009 5:53 pm, edited 6 times in total. Last edited by fish-orb on Thu Jun 25, 2009 2:27 pm, edited 4 times in total.